The congress venue CNCC is ideally located in the heart of the Olympic Green adjacent to the National Stadium (Birds Nest), the National Aquatics Center (Water Cube) and the National Indoor Stadium, and which is next to the Olympic Green station of subway line 8. 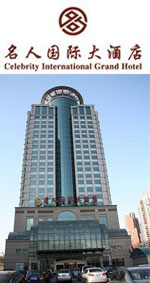 CNCC Grand Hotel is located in the center of the Beijing Olympic Green. It is adjacent to China National Convention Center. Recognized as the only international luxury hotel within the Olympic Business District, The hotel is connected with China National Convention Center. Shuttle bus is available between hotel and CNCC. For shuttle bus reservation, please contact the hotel front desk. Standard Room and one Bedroom Suite rate includes 1 or 2 breakfast, service charge and taxes, Two - Bedroom Suite includes 3 breakfasts, service charge and taxes. * Only receive the guests from Mainland China.